Oil and Cotton: Happy Mother's Day! Celebrate your MOM! Thoughtful gifts and class gift certificates are available at Oil and Cotton. Join us this week and make a gift from the heart for your mom, grandmother, sister, or loving other. Friday from 3:30-4:30 ($10) learn to make a paper flower bouquet from tissue paper and vintage book pages. This class is open to all ages. Preregistration is recommended. 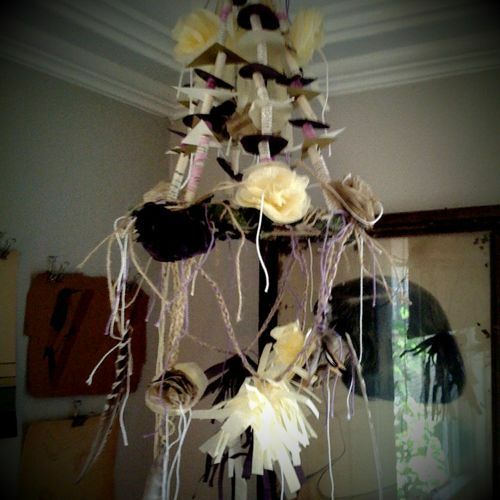 Make a Paper Chandelier this Friday evening from 6-9pm ($50). Learn the traditional art of the pajaki, a paper chandelier. Use various materials such as tree branches, feathers, decorative papers, twine and shells to construct this sweet interpretation of an old fashioned craft. Register here.